Design rendering by Brooks Stevens (American, 1911–1995) as pictured in The Milwaukee Journal, December 19, 1938. Article included in the Brooks Stevens Archive, Milwaukee Art Museum, Gift of the Brooks Stevens Family and the Milwaukee Institute of Art and Design. One of my job responsibilities is to be the curatorial liaison with the Museum’s Brooks Stevens Archives, a repository of renderings, photographs, and ephemera from Milwaukee’s preeminent industrial designer. Today I was searching for information on a custom Packard “woodie” wagon that Stevens designed in 1940 for the Stratton Family, and I turned up nothing useful to an inquiring researcher. However, turning lemons to lemonade, while thumbing through Stevens’ press clippings from the late 1930s, I found something unusual and fantastic to share on this blog! I stumbled onto a Brooks Stevens design project that differed dramatically from the snazzy lawnmowers, small engines, and radio covers that we’re used to seeing. Brooks Stevens designs always have a touch of streamlined or space age glamor, but it is not often that you see his playful side as exhibited in his 1958 modifications to the iconic Oscar Mayer Weinermobile. 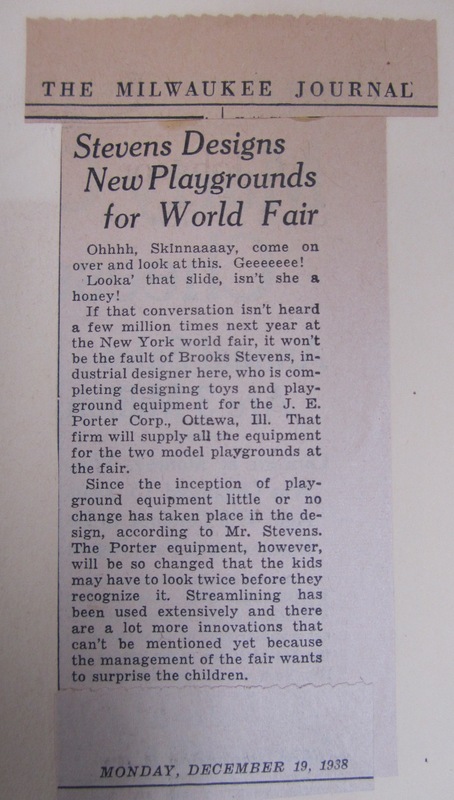 Tucked into a scrapbook filled with press clippings, I was delighted to see that in 1938 The Milwaukee Journal published images of Stevens’ designs for a Children’s Playground at the New York World’s Fair. I have never encountered these particular designs in our archive of audio visual material and renderings, so these charming designs were a surprise. Playground equipment by Brooks Stevens (American, 1911–1995) as pictured in The Milwaukee Journal, December 19, 1938. Article included in the Brooks Stevens Archive, Milwaukee Art Museum, Gift of the Brooks Stevens Family and the Milwaukee Institute of Art and Design. Does this mean that Stevens invented the term Jungle Gym?! 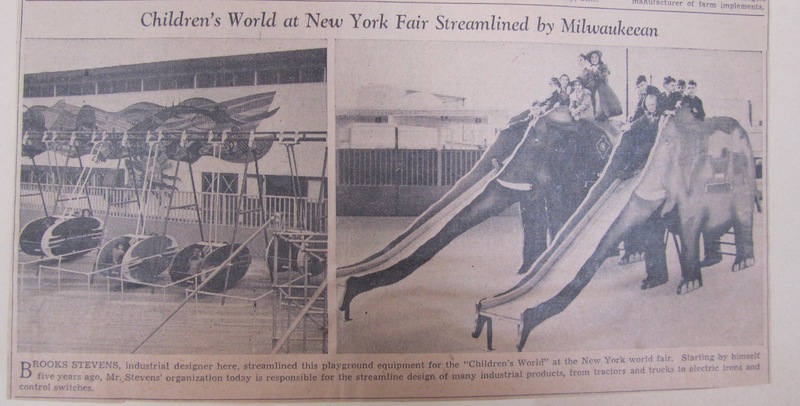 The local newspaper article published in December 1938 (four months before the New York Fair would open on April 30, 1939) gives a sense of the national excitement behind World’s exhibitions. The New York “World of Tomorrow” Fair was the Unite States’ second largest in history after the 1904 St. Louis exhibition, with 44 million attending over its two summer seasons. Preparations for all the exhibitions took years and stretched worldwide, with various countries erecting their own pavilions. The Milwaukee Journal, December 19, 1938. Article included in the Brooks Stevens Archive, Milwaukee Art Museum, Gift of the Brooks Stevens Family and the Milwaukee Institute of Art and Design. “Ohhhh, Skinnaaaay, come on over and look at this. Geeeeeeee! Looka’ that slide, isn’t she a honey! If that conversation isn’t heard a few million times next year at the New York world fair, it won’t be the fault of Brooks Stevens, industrial designer here, who is completing designing toys and playground equipment for the J. E. Porter Corp., Ottawa, Ill. That firm will supply all the equipment for the two model playgrounds at the fair. 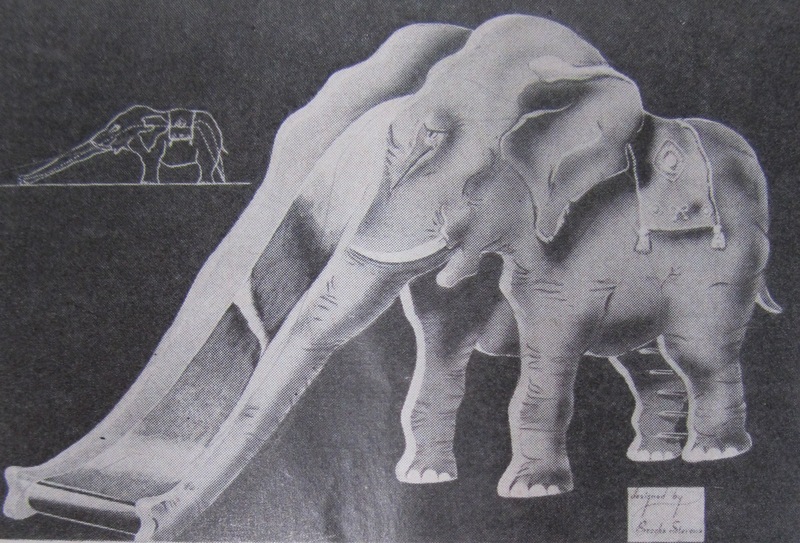 The Industrial Strength Design exhibition catalog covers the highlights of Stevens’ work, but you won’t find the elephant slide included. That is an “Under the Wings” blog exclusive! Update 7/11/2012 – There is a fantastic new museum exhibition that examines arts on view at the fairs from 1851 to 1939. Visit the Nelson-Atkins Museum’s website for the Inventing the Modern World: Decorative Arts at the World’s Fairs, 1851–1939 exhibition. The exhibition is on view in Kansas City until August 19, 2012 and it will be in Pittsburgh at the Cargnegie Museum of Art Oct 13, 2012–Feb 24, 2013. The exhibition travels to the New Orleans Museum of Art from April 14 to Aug 4, 2013, and The Mint Museum in Charlotte, NC, from Sept 21, 2013 to Jan 19, 2014. This entry was posted in Art, Curatorial, Library/Archives and tagged Brooks Stevens, Library/Archives, playground equipment, The Milwaukee Journal, World's Fairs. Bookmark the permalink.